Instead of 156,500 prisoners behind bars in Texas' 111 state prisons a year ago, the lockups now hold just over 154,000 — a drop of about 2,500, according to state statistics. Texas, which historically has had one of the highest incarceration rates per capita of the 50 states, is now in fourth place, down from second two years ago. Whether the declining prison population is the start of a long-term decrease or a short-lived dip is a matter of debate that will be settled only by time. Still, experts say, prison population declines are occurring in other states, too. "It's real. It's happening, not only in Texas, but around the country," said Tony Fabelo, an Austin-based criminal justice consultant who coached Texas officials during the 1990s as the state tripled the size of its prison system and is now advising other states on how to decrease their prison populations. "The challenge is to sustain the outcomes to see how far you can go in downsizing prisons. I have my doubts, but it's an interesting time for criminal justice," Fabelo said. The [parole] board's report this week boasts 24,342 offenders were approved for parole from Sept. 1, 2010, to Aug. 31, 2011. This represents 31 percent of all who applied and an approval rate that is six percentage points higher than 10 years ago. At the same time, the number carted back to prison this past fiscal year after their parole was revoked plummeted by 44 percent from a high of 11,374 in 2004. Instead of fearing accusations of appearing too lenient, state authorities are smiling. "We are pleased with our continuing increase in granting parole," said Rissie Owens, chairwoman of the state's pardons and parole board. "The use of our parole guidelines to assess the likelihood of a successful parole outcome has been cited as a national model for its positive impact on returning more offenders to productive lives." The Association of Paroling Authorities International has praised Texas' system which many other states are copying, said board spokesman Harry Battson. Some of the rise in parole rates may be attributed to a relatively minor uptick in paroles for serious violent felons who are nearing the end of their prison terms, a development which even victim rights advocates quoted in the story supported. In years past, the parole board frequently kept such offenders in prison until their (often long) sentences were 100% complete, at which point they would be dumped out on the street with $100 in their pocket, little or no reentry assistance, and no community-based supervision by a parole officer. More recently, the parole board has been releasing such offenders a year or two before the end of their term so they'll be under supervision during the period when they're most likely to re-offend. As somebody who hasn't hesitated to criticize parole board chair Rissie Owens and her colleagues for policies Grits considers ill-conceived, I have to give them their props: That's truly a "smart on crime" tactic, using parole powers to improve public safety significantly. In a followup editorial, the Chronicle called this a "belt-and-suspenders approach." That said, IMO the trend toward reduced incarceration levels cannot and will not be sustained long-term without further legislative action, particularly as it regards sentencing for low-level offenses and funding for community supervision. One big element contributing to prison population declines which wasn't mentioned in Ward's story was 2003 legislation mandating probation on the first offense for low-level (less than a gram) drug possession. That bill diverted roughly 3,000 people per year from so-called "state jails" (which are really not jails in the traditional sense but a euphemism for state prisons housing the equivalent of fourth-degree felons). Grits believes prison population declines won't be sustained in the long run unless the Lege further moderates sentencing, particularly for drug and property offenses. Still, these data offer hope that Texas may further embrace a rational, conservative corrections policy as opposed to the money-is-no-object, Big Government approach which has dominated since the Ann Richards era. I am seeing these changes inside the razor wire. Shorter sentences, easier parole, full treatment programs. But you hit the nail on the head--I don't see changes at the local police/district court level. We need to see more citations instead of arrests, more community supervision instead of stints in the state prison. Hells bells! Probation is such a money maker--for example, on a DWI, slap an ankle alcohol monitor on them and put an ignition interlock in their car, and the poor schmuck is paying over $500 a month in fees, a large percentage of which goes to the local jurisdiction. Main problem is that with the extremely high probation fees and expenses, many offenders won't be able to pay the tab and will end up as violators due to expense. I haven't figured out the answer to that dilemma yet. Prison Doc, I appreciate your point that many offenders do have a very high tab to pay on probation, which makes it very difficult on them. Sometimes we virtually set people up for failure with fees. However, we DO NOT revoke them purely for the inability to pay. Moreover, I must be misunderstanding your comment that "probation is such a money maker." The $500 for the ankle alcohol monitor and ignition interlock DO NOT go to the local jurisdiction. All that money goes to the companies that provide that service. And the extremely high probation fees? That's $60 a month compared to $360 for the alcohol monitor and around $75 for the ignition interlock. Probation is a money maker for everyone except the probation department. You may be right--but the websites of monitoring devices promote themselves to probation agencies based upon what a big financial cut of the fee goes to the local agency, and the company encourages adoption of that technology as a money-maker for the agency--not for any good it may do for society or the offender. If it's on the internet, it must be true! as the saying goes. I have been researching a case of a woman who in the early 90’s at age 17 was maxed out for a small amount of methamphetamine. She is now 34 and has served 17 years of a 25 year sentence. She has been given a 1 year set off for the last 6 years. Recently a parole package was prepared for her and she was taking re-entry classes but was given another 1 year set off. She is Hispanic, apparently race is an important factor in Texas criminal justice research. If someone could please post a response to my questions it would be greatly appreciated. Is there any rhyme or reason or even something that could resemble a process that governs parole decisions? I’ve been told by prison administrators that the woman’s units operate in a silo and don’t necessarily follow the same guidelines that govern the men’s units. Its historically been this way and is accepted by prison officials. Could anyone validate this? I’ve been told by several prison insiders that in the woman’s units, paroles are governed in relation to maintaining population counts in order to justify employee counts. In a case such as the above where the offender is a minority who has been in prison a long time she can expect to server out her full sentence. Can anyone elaborate on this? Anon 1:07--'Nuff said. Pretty well explains it all. Prison Doc, surely you aren't suggesting that prison or "prison industry" doesn't make money off of inmates and taxpayers at the same time are you? I'm not an advocate for pushing every device on the market by any means, but damn the prison system has perfected the phrase "cash cow" before anybody in probation heard the phrase. How much money do you estimate "inside the razor wire" made last year on commissary alone? I have said this many times. There are so many women prison beds and to justify those prison jobs, those beds have to be full. Someone high up in the LEDGE said in a Newspaper article that out of the roughly 19k women prisons, 17k should have stayed in their communities on probation. Now the problem is once you get into the system there is no way to get out of it. Women are routinely denied to keep the beds filled. That is why those prison employees write so many major cases, that is an automatic one-year set off right there. I was told 85% of the women down there would max out their sentences. What is such a waste to the taxpayers is that inside a men’s unit major cases are issued for major reasons. Inside the women units cases are issued for make-up, relationships, and falling to sleep with a book in your hand. THIS IS THE NEW NON-COMPLIANCE RULES THAT WERE MADE UP AT THE CRAIN UNIT. I do not see why any minorities or women choose to live in Texas. This is a definitely a white man's state. Probation Departments are not corporate entities. Vendors peddling ELM, SCRAM, ignition interlock, etc are corporate. Probation Departments don't operate on profit, the vendors do operate on profit. 40% or more of the total budget of any given adult probation department goes toward providing insurance for their employees. Probation Departments determine salaries for employees based on collection of the supervision fee and the way too low amount of formula funding received from the State for what is known as Basic Supervision and Community Corrections Funding. No one else involved with the arrest, prosecution, sentencing, etc. of the offender is dependent on a cost passed on to the offender. Steve is absolutely correct that the Probation Department (Adult) gets $60.00 per month per offender, that is if the Judge allows a $60.00 monthly fee and if the probationer can afford the payment. Probationers do not get revoked for failure to pay, contrary to opinions of ignorant people who weigh in on these types of discussions. Probation is rewarded with -0- financial gain from private vendors. Probation Departments budgets are stretched so thin it is ridiculous. The State provides at best 60% of the operational cost of an adult probation department. Realistically, most Departments receive maybe 35% of their operating costs from the State. Often, the funds awarded from the State are dedicated to services for the offender and not to provide operational costs for employees. It is sad, so very sad, that adult probation is dependent on the fee paid by the probationer in order to make ends meet to operate. Presently, most officers have caseloads consisting of 100+ offenders per officer. If the probation fee was to go away, then the departments would lose at least 40% of their funding. This would constitute a 40% increase in caseload size. Talk about a serious effect on morale, not to mention a more watered down version of community supervision. Many probation employees go to work for these private vendors because they can make more money. The vendor gets the money, they sell a product, and it is the probation department who is expected to supervise the case. Wouldn't it make more sense if an ignition interlock provider was responsible for notifying the Courts and the probation department when there is a violation of supervision. Instead, only the probation department is notified. So, the notification of violation to the Court has to wait, there is a lag. The technology is 24/7, the employee of the probation department does not work 24/7. Texas Probation Association is totally separate from CJAD, TJJD and CSCDS. At best, maybe 20% of all those employed by Adult Probation and Juvenile Probation are members of TPA. Those in attendance at the TPA Conferences are not who decides what Vendor to use. The majority of those in attendance are line officers who are receiving continuing education regarding professional skill based training from presenters at the Conference. The vendors aren't the ones providing the training, the vendors are the ones peddling their product. Anyone who thinks that Adult Probation is profiting from ELM, SCRAM, and ignition interlock has their head in the sand. Instead of drawing ill informed decisions about these things from looking at a TPA Website, go attend a Probation Advisory Committee Meeting or a Judicial Advisory Committee Meeting and see what is discussed. Go to the source, don't do weak investigating and draw ill advised conclusions. 11:52 writes: "Anyone who thinks that Adult Probation is profiting from ELM, SCRAM, and ignition interlock has their head in the sand"
That's true, but anyone who thinks those vendors don't influence politicians and judges through campaign contributions, lobbying, etc., also has their head in the sand. And as you point out, there's a revolving door aspect to the relationship between CSCDs and vendors that contributes to the perception by probationers that money, not good public policy, drives many of the costs assigned to them. I can't believe (well, actually I can) the focus is on money and not on trying to make a better society. It astounds me that Texans are so conditioned to the status quo that there is no imputus to change it. You don't have to live this way. So many more changes could be implemented, if Texans wanted to change their society from one that is obviously very dangerous and not at all community focused (why would anyone want to live somewhere like that, in fear all the time? ), if the numbers of those incarcerated and under supervision are any kind of indicator, to a society where sending someone to prison is seen as a failure of the community and every effort is put into changing that individual's behaviour so that they become more community-focused (and not just by throwing some biblical tracts at them, either). Why wait until parole is a possibility before you start to change behaviour? For many inmates that could be 20 or 30 years after their incarceration - 20 or 30 totally wasted years in every sence. Why does the process not start the moment they are through reception? Don't tell me it is just down to money, because it is not, it is down to attitude and selfishness. Why are there only some 12 or 15 individuals on the BPP when there are 150,000 inmates? How can 3 people adequately review the information on each case and make an educated decision on parole, when they only have around 45 seconds on average to make that decision? Great that the BPP are starting to release those with violent convictions (who are not always violent individuals) a few years from the end of their sentence. 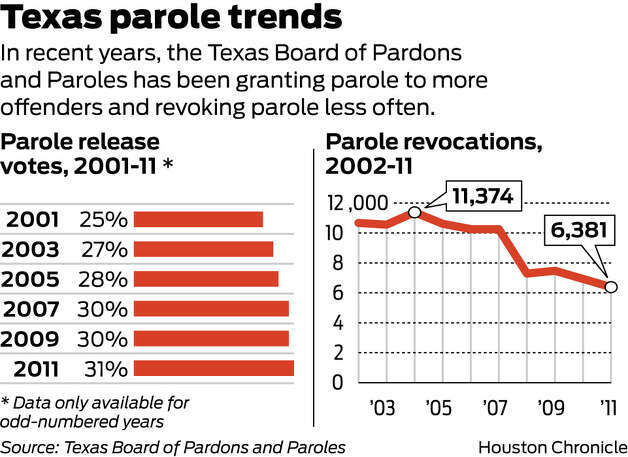 But the fact remains that the law says these inmates become eligible for parole at the half-way point of their sentences: start the rehab process earlier and you can release these inmates closer to the half-way point, thus reducing the cost to TDCJ and increasing their success rate because their families are more likely to still be around to support them. One more thing: Texas needs to stop being so obstructive towards the interstate compact applications (where an individual wants to parole to another state) and the interstate transfer aplications (where an inmate wants to transfer to another state during their incarceration). Many people don't even realise that the interstate transfer is possible - I have tried to send information on it to an inmate in TDCJ twice now and it has mysteriously not arrived, yet Texas is a signatory to both. If inmates want to start a life somewhere else, often where they do have family support, why is Texas so intent on preventing them (even if the receiving state is accepting of them), if the parole fees are only around $60 a month? For everyone so concerned about corrections making "cash cows" out of offenders, reach down grab your stones if you got em' then march down to the OCA budget meeting on Tuesday Aug. 28th and let the Lege and Govna' know just how you feel about cashing in on offenders. Try going to the OCA website and look at all the fees that get taxed on to anyone going to court. AND not one dollar of that money goes to doing a thing to treat, supervise, or protect the public. I know this response is probably too late, but I didn't realize that it was acceptable in a blog to use innuendo and character attacks as Anon 8/24-1:04 did to me. I guess it would therefore be acceptable to note that Anon's ignorance indicates a sad but severe case of cranial rectal disorder. Last year, an effort was made in the legislature to make ignition interlock mandatory on all DWI probationers, and it was supported by vendors who advertise through the Texas Probation Association. The TPA legislative committee strongly opposed that effort, and credit was given to TPA for killing that bill. The number one item on the legislative agenda that was just approved this month by the TPA legislative committee is to oppose that legislation once again. It would be a windfall for the ignition interlock vendors, but it is not the right thing to do. Anon needs to get some facts straight before hinting that there is collusion between TPA and vendors or between CSCDs and vendors. And, finally, at least I have the courage to list my name instead of hiding behind "Anon." This article is the first bit oh hope that I seen since my husband, a 20 year old college student at the time of his arrest and well-respected member of his church community, was sentenced to 18 and 15 years in prison for a possession and a possession with intent to delivery charge. Considering he tested clean every week for 5 months prior to his trial and was turned away from every rehab program he tried to enter because they saw no need for treatment, he is a prime example of outrageous sentences on people that would be much better served under community supervision. Aside from this article, my research into the criminal justice system in Texas has failed to give me any hope. All I expect now is that my husband's appeal will be dismissed and that he will not make parole since he is a trustee, more qualified than almost any of the TDCJ employees, and therefore valuable to TDCJ since they don't have to pay for his labor. What a disgrace. This system is an obvious failure and the idea that it "upholds justice" is laughable; but what is so much worse is that there are some clear, relatively simple fixes that are impossible to implement because of small minded people and the fear of not appearing to be "tough on crime."